1941-1954 Chevy Headlight Bucket Assembly is complete with everything you see in the picture new. It comes with a 12 volt bulb. 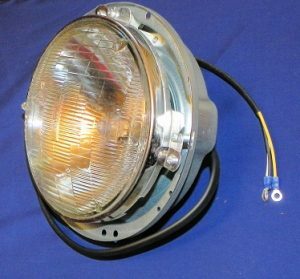 I offer 6 volt Headlight bulbs elsewhere in this website. These fit well and work well, and are complete including bulb adjustments and wiring. The wiring is NOT a duplicate of the original wiring in appearense (as you can see in the picture) but fits and works just fine. They do work well on other GM makes and models as in Buick or Pontiac. What I am offering here is one headlight bucket but 2 are needed for each car.